These bite-sized treats will satisfy your pregnancy cravings without making you feel guilty. Do you find yourself craving sweets during your pregnancy but avoid them because you're trying to eat healthfully? I'm a big believer in the phrase "everything in moderation," and love concocting sneakily light desserts that only seem indulgent and decadent. My Mini Blueberry-Lemon Cheesecakes are a great example—they'll satisfy your sweet tooth with less sugar, fat, and calories than other desserts. My secret? Greek yogurt lightens them up, gives a more delicate texture than traditionally heavy cheesecake and lends amazing flavor. This recipe also uses other little tricks I've picked up as a recipe developer for WeightWatchers, as well as tips I've shared as a healthy eating coach for gym boot camp participants. I thought I'd share some of them with you, too! There's room in everyone's life for treats! Go bite-sized: One of the keys to healthy eating is to keep portion sizes in check, especially for desserts. I often write recipes to make in ramekins, muffin cups or mini muffin size for this very reason. When sweets are served in cute pre-portioned sizes you're less likely to have "just another small sliver" and go overboard. Keep this in mind when you're picking up treats at the bakery or ice cream at the supermarket too. Seek out easy swaps: If you're a baker there are some ingredients that are easy to substitute for light versions without compromising flavor or texture (ie: yogurt, cream cheese, egg whites). I favor low fat versions of dairy products over fat free because they give a richer mouth feel that will leave you feeling satisfied. Another easy baking substitution? Cut the oil or butter in a recipe in half and use a fruit puree to replace it. Try baby food prunes, applesauce or mashed banana depending on the dish. Bake in small batches: Many dessert recipes are written to serve a crowd, and while you can easily double or triple this one it's written to yield only 4 mini cheesecakes. Fewer leftovers to call out to you late night! If you have a favorite dessert recipe consider cutting it in half or gift the extras so you're not tempted to overdo it. 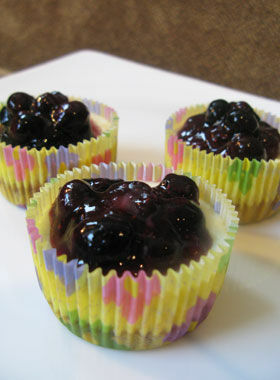 Fruit is your friend: I use lightly sweetened fresh blueberries to garnish these cheesecakes. It's a great way to make any dessert portion bigger (ice cream sundaes, to top angel food cake, etc). Another fruit tip? A little lemon can make all the difference. One of my favorite additions to fruit-based desserts is lemon juice or lemon zest. It lends lots of bright flavor so you won't need as much sugar. And last but not least....ditch deprivation: If you're really craving something and don't let yourself have it you may find yourself compensating with other unhealthy foods or finally give in and over-indulge later. So go ahead! Don't deny your sweet tooth. Try my Mini Blueberry-Lemon Cheesecakes and some of the tips above—and be sure to enjoy every sweet little bite!